A cluster of hamlets and villages in Amtala, South 24 Parganas District (West Bengal) get their names from a community of fish farmers-'Ghora Para', 'Mondal Para', 'Mistry Para', 'Gure Para', 'Bera Para'. The farmers, here, can be found cultivating fish on their rooftops or in their backyard ponds. Interestingly, the spawn they rear are not consumed. Termed 'live jewels' or 'ornamental fishes' , these go on to enhance the decor of urban drawing rooms with their vivid colours and playful nature. The fish travel a long distance from their natural habitat to the farmer's pond/tank to urban dwellings and public aquaria. So, the cultivators must ensure a long-as well as healthy-life for them. More than physical strain, raising the fish require a watchful labour of intimacy; the fish farmers regularly claim that they have to be treated like children. Moreover, the nurture has to be exactly replicated by the fish enthusiasts who buy them for their aquariums at home. As a hobby, ornamental fish keeping has travelled across the boundaries of nation, generating potential for cultural exchange. It has been identified as the oldest and second most popular hobby in the world next to photography(Mahapatra and Datta 2). The trade also involves a wide milieu of people- fish farmers, retailers, exporters, (aquarium) appliance suppliers, hobbyists from various economic backgrounds, academic researchers, development professionals and recent day, conservationists. Back in the 2000 BC, the Chinese kept selectively breeding goldfish till they began appearing in glass bowls, wooden tubs, porcelain containers and artificial ponds all over the world as pets. The use of the glass aquaria in domestic and public spaces started in Rome, spread to England, and from there- to India. (Chaudhuri 2016). According to Dr. B.K. Mahapatra (Principal Scientist, Center for Fisheries Education), kings and zamindars from various provinces of West Bengal and India enjoyed the company of colourful fish in their garden pools- termed as 'vivaria'. They collected local varieties like the Rohu, Katla, stinging and walking catfish, before imported varieties started coming in and before garden pools had to be replaced by drawing room aquaria. Writer Gerhard Netel says that aquariums make us feel a little like playing God. They are of great appeal to the amateur naturalist and the hobbyist alike since, observing the whole life cycle of the fish-from their birth to reproduction to death- provides "the greatest show on earth". (Fritzsche 2011)The idea of "balanced aquarium"-recreating the harmony of nature in domestic tanks, public parks and aquaria-developed from biologist Matthaeus Bechstein's explorations in aquarium and terrarium sciences. "According to this method, fish waste could be consumed by plants, and plants along with the air surface of the water could supply oxygen to the fish. " (Mahapatra and Datta 2016). The first public aquarium opened in Regent's Park, England in 1851. The establishment of nineteen public aquaria also inspired hobbyists, with the oldest public aquarium in India (1851)- Taraporewala located in Mumbai. The largest underground aquarium in the Asian sub continent-22 m in length and housing 400 species- was also set up at Bagh-e-Bahu, Jammu (State of Jammu and Kashmir)in 2007. The demand for exotic species has greatly increased among pet keepers, here; currently, 99 percent of the agribusiness is dependent on the hobbyists and one percent on open aquaria (Chaudhuri 2016). According to Marine Products Export Development Authority of India in 2003, by the start of the 21st century, India boasts of over one million aquarium fish enthusiasts. (Ghosh 2003; Mahapatra 2003; Datta 2003) Moreover, inculcating this in one's pastime greatly reduces stress and hence, is being highly recommended. In India, selling bright freshwater fish had been a minor occupation, catering to a small time hobby domestically with little scope for export. Between 1850-1947, the British introduced the first ornamental species to India. A India Today report mentions- they brought goldfish from China, guppies from Trinidad, molly from Mexico, Siamese fighters from Thailand, angelfish from the Amazon, discus from Brazil to the Indian market. (Ghosh 2003). A more sustained role in arousing public interest was played by aquarium societies around the world, who brought ornamental fish to public notice through meetings and by publishing their own journals, magazines and training manuals. The first of these clubs appeared in Germany, where fish enthusiasts gathered for "fish exchange" and sharing of 'How-To books', namely the oldest Gotha Aquarium in 1882 and the Triton Society in 1886. In India, currently aquarium lovers have formed online forums to exchange information about keeping and maintaining fish in the home aquaria, and one of them, indianaquariumhobbyist.com lists a number of functional clubs like Aquarium Club - Aquarium Hobbyists Of Hyderabad (AHH) , Luck now Aquarium Society (LAS) and Maharashtra Aquarist's Society (MAS). The farming is a self-created occupation (albeit new) for many, taken up by individual entrepreneurs before governmental aid (or recognition) was possible. Even though history of systematized income from selling ornamental fish is relatively brief (having developed in India over the last seventy years), its growth rate is encouraging many to pass it on as a hereditary livelihood to their children. Case in point is independent farmer and retailer, Kinden Ghora from Amtala, Udayrampur. Kandon, who inherited his love of fish from his father, started his journey with mere earthen vessels twenty-five years ago; he later shifted to earthen and plastic tubs (locally called ‘majla’) and finally to the indoor aquarium and family-owned pond. Selling 1,500 fish on an average every week, the Ghora family earns Rs. 6,000-7,000 a month. Kandon’s daughter, Disha Ghora who is pursuing her B.A. in Philosophy from a college affiliated with Calcutta University aspires to take up fish farming like her father, once she graduates. Her mother, Putul Ghora also comes from a family of fish farmers. Same with the members of the Jafarpur Mahila (Women) Cooperative who aspire to stick to this occupation even in the face of fund shortage. They appreciate that they at least have a trade to live by and pass on to, contrary to unemployed populace in the cities. In the three interconnected localities of Ghora, Mondal and Mistry Para, one can find majorly entrepreneurs keeping their agribusiness within the family. There is an implicit understanding among the neighbours about who farms which fish at a greater scale. Uttam Mistry, living a few yards away from Kandon Ghora’s home, specializes in the Siamese fighter fish which the Ghora family does not keep. The fighters have to be reared separately in glass bottles and kept on a once-a-week diet of sludge worms. If they live together, they will fight to death; if they eat more frequently, they will die as well. For reproduction, usually a pair is kept in an earthen pot, where the male weaves beautiful bubble/foam nests (air bubbles coated with saliva)in which the female lays her eggs. A fighter fish generally costs Rs. 150, which is significantly more than the common guppies, mollies, angels and goldfish that are rated within Rs.5- 10 per piece. Sunita Guchhait, member of Jafarpur Women's Cooperative in West Bengal, reported the shortage of funds to provide artificially prepared food to the vast number of fish each household rears. Each fish pond consists of fifty thousand fish on average. To solve the problem, she (and other women) make as many as forty chapatti-s (Indian bread) every alternate day, and feed the crumbs to the fish who seem to relish it. Almost all family members, whether in the homes of independent fish farmers or those operating in a collective, recognize symptoms of sickness in the fish. When they become sick or injured, they usually float near the water’s surface and they stop eating. Some turn pale and their heads and tails acquire whitish tinge. To bring them back to health, they keep them in a separate vessel, and often strictly on a medicine diet, stopping their regular food intake. Dr. Mahapatra, Principal Scientist at ICAR-CIFE (Kolkata) has described the following common diseases affecting ornamental fish-mouth fungus, rotting of leg and fins, dropsy, infection from hydra and problems in defecation. Symptoms include "erratic swimming, clamped fins, abnormal opercular movement etc." (Mahapatra 2016) Common salt, copper sulphate solution, potassium, formalin (forty per cent) and Methylene blue can usually be used to treat them. Perhaps the most caution is required while conditioning the fish physiologically before they are transported locally, interstate and overseas. Weeks of action has to be planned before a volume of fish are ready for the market; the fish have to be lifted from the pond, and kept isolated in a vessel before they can be put in packing bags just prior to the transport. Incaution during water exchange results in the most deaths, mentions Ranajit Gure, in-charge of Jafarpur Mahila Samity. While some fish farmers like Kandon remain outside cooperatives, many have formed Self Help Groups formed with financial aid. (Chaudhuri 2016)The societies started forming between 2001 and 2003 after the Fisheries Department received a Rs 7 crore grant from the National Cooperatives Development Corporation. Soon, there were 11 women's cooperative groups across the state. (Ghosh 2005) Ranajit Gure got interested in the colorful fishes round 2001,while he was temporarily staying at Sealdah (Kolkata). In eight to ten 'majla'-s, he started rearing spawns of mollies, guppies and gold fish in his ancestral home in Jafarpur. His wife, Sujata Gure- currently Secretary of the Cooperative also started learning the 'fish craft' ('Machher kaj') round that time. Both their families have lived here for generations, and it was relatively easy for them to form the Jafarpur Mahila Samity. Currently, it has thirty six core members (women) who are engaged in the daily nurture of the spawns and fish. Many of these women practice fish farming at home along with working for the Cooperative; they have cement tanks in their backyards, and have family-owned or shared ponds. They have furthered their skills through training programs conducted by the West Bengal University of Animal and Fishery Sciences, Kolkata. The fish they rear come in varied colourations; goldfish- three types, red carp- two, molly- three/four. While they produce indigenous fish in greater volumes, more exotic varieties have to be raised in tubs since, most are not acclimatized to the ph level in local ponds yet. This significantly cuts down on their numbers ( since, in general, fish grow better in ponds). With better training in managing imported fish, hubs in Howrah are raising them more successfully. It is from Howrah- the world's largest wholesale fish market- that the Samity brings its supply of spawns. Now that the village has sufficient number of each exotic and indigenous variety, they produce more than they buy. Talking of natural adaptations, Ranajit and Sujata Gure cited examples of the litchi goldfish and mollies that have recently started thriving in the local ponds. Previously, they had to be reared in tanks and tubs. They have also noted another interesting variation in the fish; how their bodies change hue depending on where they are kept- pond or tank or aquarium. Compared to ponds, certain varieties when raised in cement tanks, often develop brighter hues - informs the Gure-s. Previously, juicing (artificial colouring) would be practiced on the Indian Glass fish, Black tetra, Oscar, Goldfish, Sucker mouth catfish, Blood Parrot chichlids etc. (Chaudhuri 2016)The farmers,now, try marigold flower diet and pellets (along with supplying a nutritional diet) as prescribed by CIFE, which improves colouration in fish. The Samity members have to keep in mind the breeding season and method specific to live bearing(retaining eggs inside the body and giving birth to live young) and egg-laying species for fish to grow in volume all the year round. Live bearers like goldfish, guppies, sword tails, platies and mouth brooding (incubating eggs inside the buccal cavity) chichlids lay eggs in winter; mollies breed in summer; egg layers like the fighter can also be found breeding in the summer months. Rearing fish like the Beta (fighter) requires a constant supply of tap water and glass bottles in which the males must be kept separately. Lack of tap water in Jafarpur and resource to buy suitable containers are curbing the rapid growth in fighter fish production in Jafarpur, as opposed to hamlets in Udayrampur. The Samity wants further training sessions to prepare better quality food for the fish, medicines for sick fish and to rear special imported varieties like red tails, rainbow and silver sharks that are in great demand as pets. Depending on how quickly they learn the trade, entrepreneurs outside the society are often earning more. On an average, it brings Rs. 7,000-8000 a month, confirms Ranajit Gure, while individual farmers can earn up to Rs. 15,000. Among the three metropolis majorly engaging in this trade, in Kolkata, goldfish and gouramis are mostly bred, reared and sold; farms in Chennai produce live bearers- Koi carps and chichlids at large scale; Mumbai fish breeders generally cultivate expensive and rare varieties- angel, discuss strains, different tetras- emperor, rummy nose and neon. Among indigenous fish, freshwater ornamental species are more widely kept as pets in West Bengal than marine species. The marine varieties are part of public aquaria. i) Active Gear: moved through water by human pressure. ii) Passive Gear: Usually left standing in water bodies for a period of time; locally improvised traps are called Ghuni, Atol, Mogra, Roh etc. iii) Seine Nets: Catches fast moving fish like Mola, Punti, Chanda. iv) Scoop nets: Used to sweep up woody debris to collect fish. v) Thela Jal: Triangular shaped and used for catching small species. vi) Chat Jal: Made by mosquito net; put in large sized water body to catch all types of fish. vii) Chekke: Made of bamboo; used in streams and swamps for small ornamental fish. viii) Pata: Long, continuous structure of split bamboo screen or nylon net laid across river or passage of fish. ix) Ghuni: Traps Kholse, dwarf chameleon fish etc. x) Roh: used in terraced paddy fields for small indigenous ornamental catches like Puntius, Danios etc. The fish are bred and reared in earthen pots, tubs (majla), culture tanks, glass aquaria and fish ponds. In all of these hubs, whether in a hamlet in West Bengal or in a Tamil Nadu village, one finds ponds divided by stretches of nets where to keep fish in natural environment, yet separated from a different species. Fifty thousand fish on average can be grown in a standard sized pond- most interestingly, the ornamental fish live near the water surface- their territories demarcated by the nets, while food fish cohabit the same pond-in deeper waters. 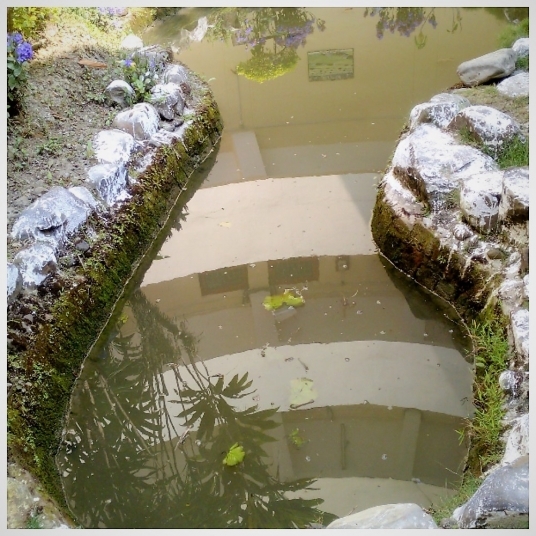 The ponds, which are either family-owned or taken on lease for a certain period, have to be prepared for the rainy seasons when the cultivation is at its peak. The Central and State Institutes, besides providing guidance and training to fish farmer cooperatives, are also engaged in a) researching the scope of several wetlands for fish farming, and b) conserving and increasing number and quality of ornamental fish. Along with tapping into India's natural water reservoirs, some wetlands have been specially designated for ornamental fish projects. Given that aquarium fish have been recognized as 'sun-rise trade' products by the government of India (Chaudhuri 2016), new initiatives are being undertaken by central and state institutes of fishery sciences, namely Indian Council of Agricultural Research- Central Institute of Fisheries Education (ICAR-CIFE) to study these species in natural and man-made wet lands. One of such wetlands is East Kolkata Wetland (EKW), acknowledged as "Wetland of International Importance" by the Ramsar Convention on August 19th, 2002. As part of rapid field surveys between June, 2012- July, 2014, different ornamental species were collected from ponds at EKW, brought to fish assemblage centers in the city like Choubhaga (South), Bantala (South East), JhagraSisa (East), Mahisbathan (North) and Saheb Mara Bheri (West) and categorized according to their colours, body shapes, banding patterns, preying habits etc. After confirmation at the CIFE, Kolkata laboratory, twenty four rare, twelve sporadic and five uncommon species were noted among the forty one indigenous species found in EKW. The potential for entrepreneurial initiatives in this agricultural sector is driving studies within the central and state institutes as well. ICAR-CIFE (Kolkata branch) has a separate observatory for maintaining well-loved ornamental fishes- for e.g., common loaches, Kerala cat fish, different sized angels and goldfish, chichlids of varied colours, Indian glass fish, snakeheads, Koi carps, gouramis and punti. Approximately 250 species of wild ornamental fish have been identified in India; 155 of them are captured from streams in North Eastern Hilly (NEH) regions. CIFE is exploring the richness of NEH water zones, both to conserve wild fish of ornamental value abundant in those streams (now threatened due to increasing aquatic pollution) and also to support more livelihoods. A similar initiative is DST-INSPIRE Research scholar, Tania Banerjee's work in this field at CIFE-Kolkata on Danio dangil-categorized as least concern species according to IUCN red list, but gradually decreasing in natural numbers due to ignorance and uncontrolled exploitation of nature. "Danio dangila is an indigenous ornamental fish of India. Mainly distributed in North Eastern India like Arunachal Pradesh, Assam, Meghalaya, and Northern Bengal etc.This species belongs to mountain streams, mainly cold water species. This fish has beautiful silvery appearance; bluish colour is observed in entire body with mottled pattern. It has two pairs of barbells which resembles like moustache so termed as mustached danio. This is also used as food fish in some north eastern states of India. Both male and female have almost equal colouration so this is an extra advantage for this species from economical aspect. Both sexes have equal acceptance in the ornamental fish trade. 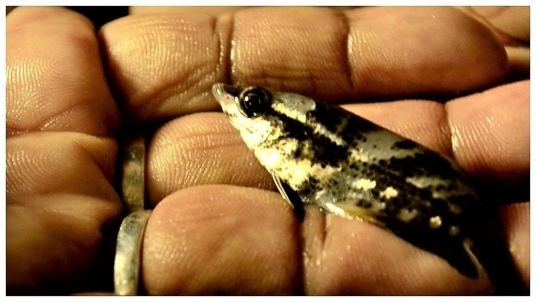 This fish was first collected in 2009 and appears as a form of Danio dangila. This danionin species is also found to be costly. Its overseas value is 1.50US $ per pair and Rs. 12-14 per piece in local market of Kolkata (Mahapatra et al., 2016). It has shoaling behaviour and it is very fast swimmer. Very hardy in nature, mainly surface feeder but consume food from bottom in captivity when left undisturbed. Omnivorous in nature but preference has been shown towards animal feed in captive condition. 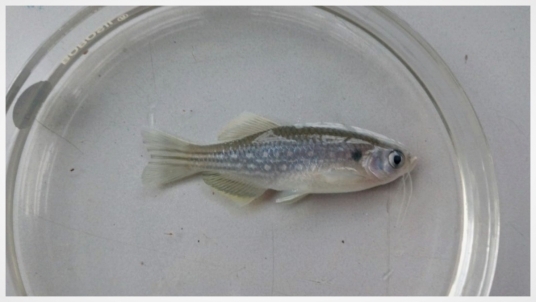 In ICAR-Central Institute of Fisheries Education, this wild, economical beneficial cold water fish is reared under captivity. Government funding agency Department of Science & Technology (DST) has granted and provided fund to carry out this research project. As the environment of Kolkata is different from northern Bengal and north eastern region of India, this becomes a challenging project, entitled “Biology, captive maturation and breeding of Danio dangila”. In this research work, we are studying on its biology, trying to mature this cold water fish and produce a breeding protocol under captivity." Two markets specifically cater to the regular need of ornamental fish enthusiasts as well as fish traders and exporters. The 'Haathi Bagan Haath' (formerly located in North Kolkata; now shifted to the adjacent Galiff Street) has been one of the largest whole sale ornamental fish markets in East and North Zone. Hobbyists have been gathering there on Sundays for live pets of all kind-fish, turtles, puppies, rabbits, caged and poultry birds, pigeons, white rats, mongooses, plants and saplings. Besides, accessories to accompany these hobbies (feed and appliances for fish keeping, for instance) are also sold here making it the go-to place for the entrepreneur or the pet-owner. The other market at Howrah (Diamond Harbour, South 24 Parganas), known as the largest in the world, attracts thousands of ornamental fish suppliers. Twenty five to thirty shops are market buy 2 lakh (volume) of fish on an average every week from the fish farmers and retailers gathering here to both sell their produces and to buy spawns of imported varieties. From the Howrah market, fish cultivated in the local ponds are transported interstate or internationally. There are few livelihoods in which occupation and hobby complement each other as beautifully as in ornamental fish farming. Both have to be sustained by the common practice of nurture. Natural, anthropological and cultural history meet in this practice, giving us a breather from the technological humdrum of 21st century life and helping us appreciate nature's bounty. Chaudhuri, Sagarika. 2016. Economic Zoology. NCBA: Kolkata. Ghosh, A., Mahapatra, B.K. and Datta, N.C. 2003. 'Ornamental fish farming – Successful small aqua business in India'. Aquaculture Asia 8 (3): 14-16. Mahapatra, B.K. 2016. 'Collection of Indigenous freshwater ornamental fish from wild.' In Best Management Practices for Freshwater Ornamental Fish Production. edited by Atul Kumar Jain, V.P. Saini and Vaneet Inder Kaur, 124-140. National Fisheries Development Board: Hyderabad. Mahapatra, B. K. 2016. 'Ornamental fish culture – an Overview.' Training Manual, edited by Mahapatra, B. K and S. Datta, 1-3. MPEDA sponsored basic training programme on Ornamental fish breeding and culture. Organized by Central Institute of Fisheries Education, Kolkata Centre and the Marine Products Export Development Authority, Kolkata Regional Office. 08th – 12th October, 2012. Kolkata, India. Mahapatra, B.K. 1993. 'Fish Disease'. Sabuj. 3(2): 1-3. Mahapatra, B. K. and Lakra, W. S. 2014. 'Indigenous Finfish Biodiversity of North-Eastern Region: Current Status, Potentials, Threats & Management Issues'. Indigenous Fin fish Species for Aquaculture Diversification: Current Status and Prospects in North-Eastern Region, edited by Krishna Kanta Tamuli, Sushanta Borthakur, Bipul Phukan and Sangipran Baishya, 42-62. College of Fisheries (Assam Agricultural University): Assam. Mahapatra, B. K. and Lakra, W. S. 2014. 'Ornamental Fishes of East Kolkata Wetland, West Bengal, India'. International Journal of Scientific Research. 3 (12): 406-408. Peter Fritzsche 2011. The Turbulent World of Franz Goll. Harvard University Press: London.